Oceanic Edibles International Limited (OESIL) is that part of the Oceanaa Group of companies that looks after frozen fruit and vegetables, and related products. When freshly harvested fruit or vegetables are frozen very rapidly, they retain the maximum amount of goodness and nutritional value as well as the original colour, flavour and texture. Our Individual Quick Freezing (IQF) Process is at present the only method whereby virtually all the properties of most foodstuffs can be preserved. The most important feature of this process is ultra-rapid freezing to very low temperatures (-30°C to - 40°C) designed to halt the activities of microorganisms that cause decay and deterioration of food. With this latest technology available it is now possible to preserve and store fruit and vegetables in fresh condition for more than a year, with the color, flavour and texture of the produce remaining as good as fresh from the farm. Direct from the farm to the table with all of nature's goodness in every bite - that's what OESIL aims to achieve with its IQF technology and state-of-the art manufacturing and storage facilities. Using best practices at every stage of the process, OESIL aims to be one of the world's most trusted suppliers of frozen fruits and vegetables. 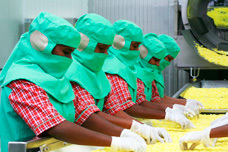 OESIL's fruit and vegetable manufacturing facilities are located at Marakkanam Village, Tamil Nadu, and Annur in Andhra Pradesh, both in India. Due to their proximity to Chennai , a major South Indian port, movement from harvest to destination without any time lag or wastage is ensured. The IQF Processing Plant for frozen mango puree and frozen diced vegetables and fruits has an IQF freezing capacity of 3.6 tonnes per hour, with additional 3 blast freezer with the freezing capacity of 40 tonnes per day. It also has a massive Cold Storage Facility to store products at -18 °C, with the capacity to hold over 3000 tonnes of frozen products. Spread over 6 rooms, each room comes equipped with racks to hold 500 tonnes of product. A mezzanine floor supported by lifts helps in transferring the stock. We are procuring the raw materials from our group company Oceanic Bio-Harvests Limited (OBHL) which has contract farming arrangements with the farmers in a radius of about 100 km to minimize the time between harvest and processing. All the growers employed are committed to environmentally sound and sustainable agricultural practices. OBHL distributes superior planting materials (right seeds) to the farmers and provides clean water, fertilizer management systems and agronomical guidance. A team of agri-experts is employed to ensure that the farmers use the right type & dosage of fertilizers and seeds in the fields. The farming system followed maintains and replenishes soil fertility without the use of toxic and persistent pesticides and fertilizers. OESIL also buys fruits and vegetables from its long-term suppliers, apart from local growers, individual farmers and farmers' cooperatives in the nearby regions. All the fruits and vegetables are grown on nutrient-rich soil, with a moderate climate, plentiful water and growing practices that provide the right conditions for producing top-quality produce. The Individual Quick Freezing (IQF) Process involves rapidly freezing fruit, dices of fruit, or vegetables so that they remain free-flowing. OESIL uses the most modern IQF machinery that meets the most stringent requirements of quality, hygiene, and production in a controlled environment for the European, American, and Japanese markets. A fully mechanized Process Line at the IQF Department maintains stringent standards of hygiene. World-class equipment imported from Denmark is used to handle the vegetable products.